Even Sweeter Dreams: Happy weekend! Hi friends! It's weekend!! Time ro relax, read a good book, bake a cake, or take a long walk in the woods. I love to take some 'me time' and fill the days with things I love (and every now and then clean the house on a sunday). Tomorrow I am going to bake a cake for my aunt's birthday. A lovely pear/cinnamon cake, one of my favourite's, especially now in the fall. 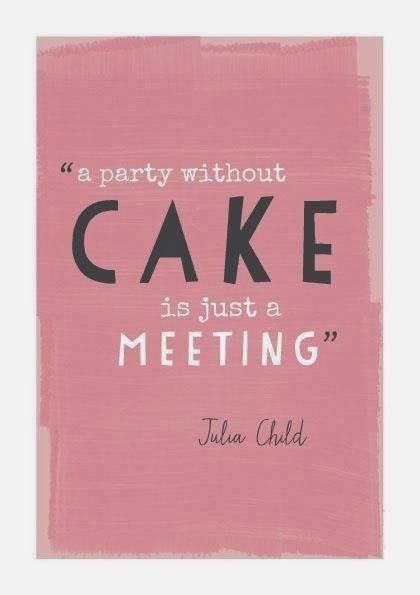 Don't you just love this quote by Julia Child? It's oh so true! Every party needs a cake, or two! And if it's a good party, it will have cupcakes as well haha. On other news: what do you think of the new lay out? I loooove it. It's so dreamy!! I have to thank my dear friend Jacoline for this beautiful lay out, she wanted to help me redesigning my lay out. She ended up buying this lovely lay out for me as an early christmas present, isn't that the sweetest thing?! I am very happy with the look of Even Sweeter Dreams. But my friend also gave my baking blog Sweetie Pies a make over, which is equally awesome I must say! Have a great weekend everyone, and do the things you love!